Frank, (yep, the Frankie B’s Frank,) is a talented gent who creates custom painted murals, among many other talents. In his request for a logo, Frank knew he wanted to utilize a bright red color, and he envisioned something in the style of a baseball logo. The above logo pretty much popped right into my head upon hearing Frank’s request. Although I did a research on baseball logos. I have a fantastic retro Yankee’s tee that was my dad’s when he was growing up, and that was the inspiration that I went with. 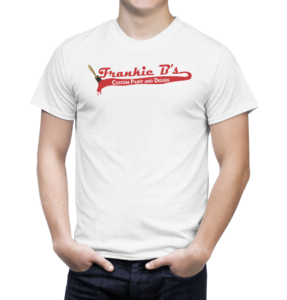 Frank really wanted a logo that he could put on a tee shirt. The result, below, was very happily received.